Today considered a superfood, cranberries are one of the few foods truly native to North America. Cranberries have been harvested by Native American peoples since they first set foot onto North American soil. Cranberries were used as both a food and a medicine by First Nation peoples. As a food they were often mixed with dried meat, pounding the mixture into a pulp called pemmican. They also ate the berries raw or in a sauce, sweetened with maple syrup. As a medicine, cranberries were used as a poultice for wounds and a cure for blood poisoning. It was also used as a dye to brighten fabrics. To early settlers, cranberries were an excellent source of vitamin C consume to prevent scurvy. Commercial cultivation of the cranberry began in the early 1800’s on the east coast of the United States. There are approximately 3000 hectares of cranberries grown in Canada. Canada is the world’s second-largest producer of Cranberries. Ontario has only three commercial plantings or bogs: Johnston Cranberry Marsh near Bala, Iroquois Cranberry Growers south of MacTier and Upper Canada Cranberries in Ottawa. BC accounts for approximately 12% of cranberry production in North America. They need a carefully controlled water supply, both for irrigation and for the flooding technique used to harvest them. In the winter the bogs are flooded to form a layer of ice, this prevents winter damage and allows machinery to drive out onto the bogs to lay down sand and to ditch the perimeter of the bog. In the spring the flood is drawn off and the plants begin to grow. In the fall berries that are to be sold fresh are harvested dry, using a machine that combs the berries off the vines. To harvest cranberries for processing, the bog is flooded to a depth of several inches and a mechanical beater knocks the berries into the water; as they float, they are pumped into trucks for transport to the processing plant. Cranberry’s list of potential benefits is long: prevention of urinary tract infection, gum disease, stomach ulcers, heart disease and cancer, are just a few. Cranberries are thought to provide health benefits due to their flavonoid and phytonutrient content. These naturally occurring compounds provide antioxidant and antimicrobial benefits to the body. Cranberries also provide numerous cardiovascular benefits. They have been shown to reduce low-density lipoprotein (LDL)-oxidation, maintain or improve high-density lipoprotein (HDL) levels, reduce platelet aggregation and improve vascular function. Cranberries are packed with Vitamin C. One cup of cranberries provides 22 percent of the recommended daily intake. Another component of cranberries is the antioxidant Beta-Carotene. 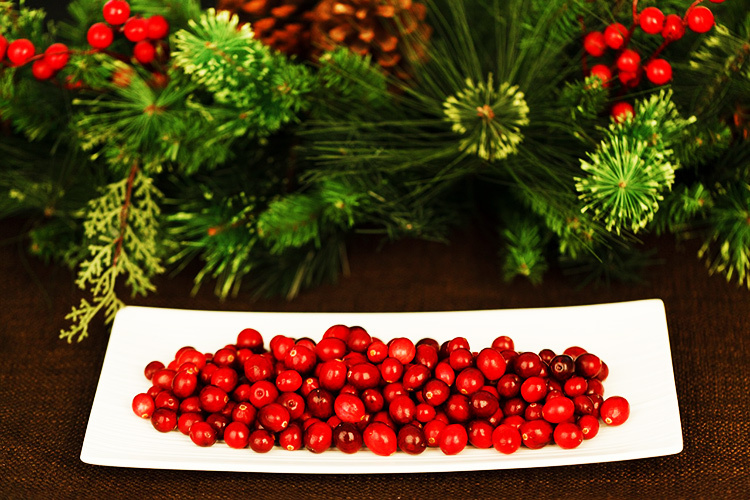 It is one of the ingredients that give cranberries their red color. Beta-Carotene helps the body synthesize Vitamin A which is best known for its part in providing healthy vision. A barrel of cranberries weighs 100 pounds. Give or take a few, there are about 450 cranberries in a pound. Approximately 4,400 cranberries are squished for one gallon of juice.